TCS is India's largest IT company. 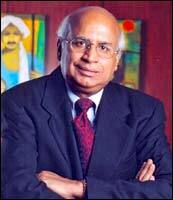 Set up in 1968, pioneering TCS laid the foundation of India's booming software services sector, under its first CEO F C Kohli. Ramadorai, a 32-year TCS veteran has built considerably on this legacy. In the eight years under Ramdorai's leadership, the company's turnover has increased almost ten-fold from Rs 721 crore (Rs 7.21 billion) to Rs 7,123 crore (Rs 71.23 billion). From 1997 the number of employees has grown from 9,500 to 41, 000 people today. Moreover, TCS has expanded its global footprint to 33 countries and has 210 offices; it also has 18 global delivery centres overseas. In August the company's much-awaited IPO successfully raised over Rs 5,000 crore (Rs 50 billion). Born on October 6, 1944, Ramadorai grew up in New Delhi. He has a bachelor's degree in Physics from Delhi University and a B.E. (electronics and telecommunications) from the Indian Institute of Science, Bangalore. He also has a masters in computer science from the University of California, Los Angeles. Ramadorai is on the boards of Hindustan Lever and Nicholas Piramal. He has been designated as IT Advisor to Qingdao city and Hangzhou city, in the People's Republic of China. He is member of the Corporate Advisory Board, Marshall School of Business. A fellow of the Institute of Electrical and Electronics Engineers and the Indian National Academy of Engineers, he is vice-chairman of the National Association of Software Companies, NASSCOM.